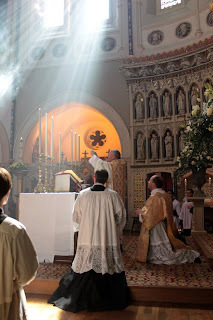 On Sunday, Archbishop Bernard Longley celebrated Mass at the Oxford Oratory, in the Church of St Aloysius which is dear to me since I attended daily Mass there when I was an undergraduate. You can see the "Benedictine" altar arrangement for the Mass in the Novus Ordo, facing the people. There are more photos at James Bradley's Flickr set.